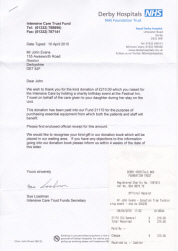 John Evans has raised, so far over £200,000 for charity. Much of John’s work is done to raise money for charity. John Evans Strongman Limited has raised thousands of pounds for worthy causes, headbalancing anything and everything businesses have challenged him to do. 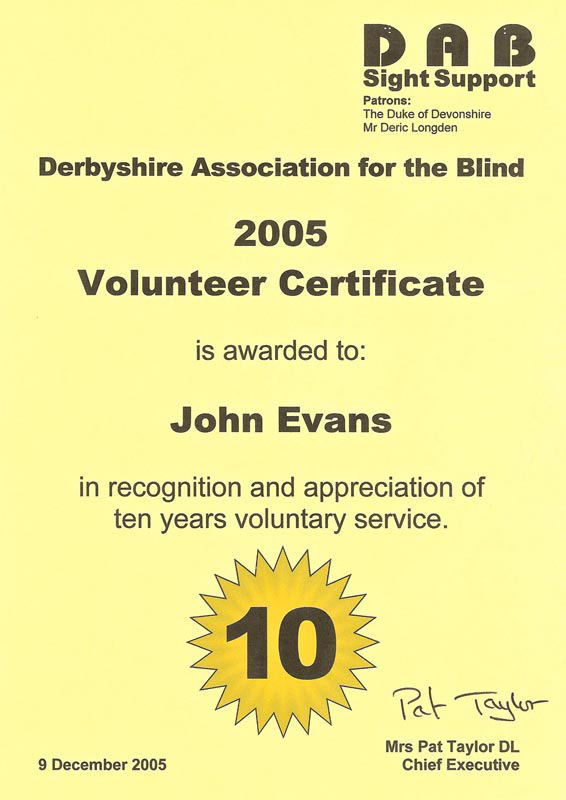 Much of John's charity work is for the Derbyshire Association for the Blind. This is Edward Bright, 7 years old, he has lost both arms and legs due to menengitas. 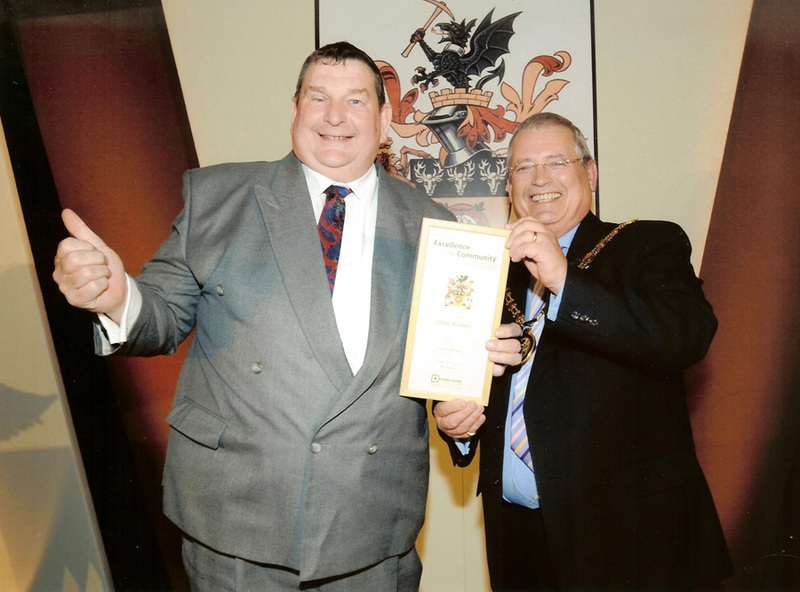 Big John still managed to put a happy smile on his face whilst raising money at a charity event. 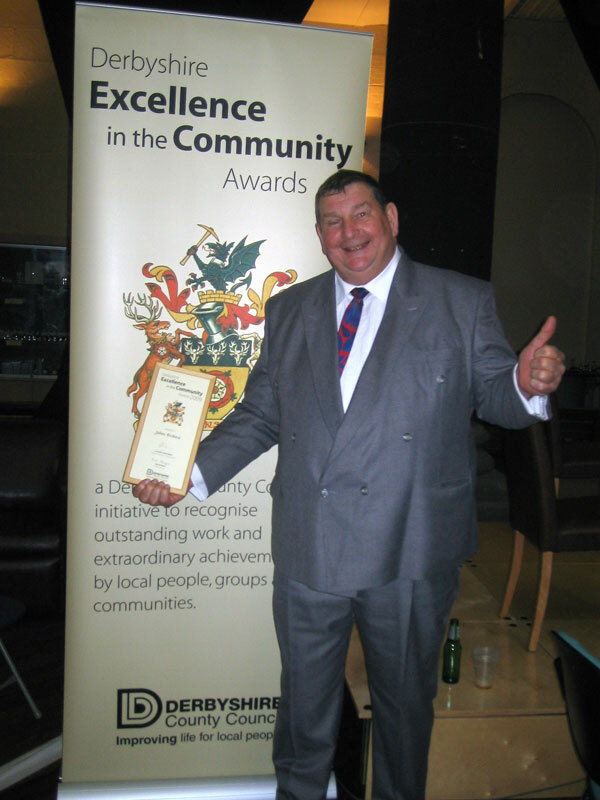 Here's a picture of John Evans all suited and booted accepting a prestigious award event in 2009 from his local Derby County Council for his charity fundraising efforts. 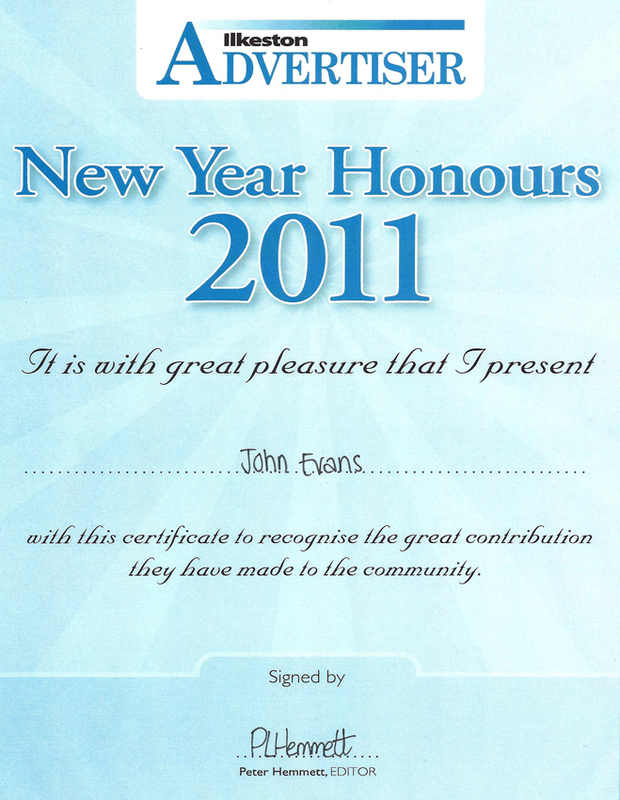 A new certificate, awarded to John from his local newspaper Ilkeston Advertiser for "New Year Honours 2011"
The "bunk beds" photo was apart of an event raising money for children in need 2008. 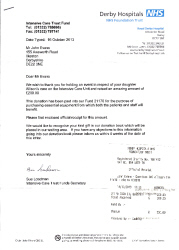 Another Children in Need event is captured by headbalancing motorbike picture and cheque. After balancing bread Ilkeston sponsored by Stacey bakers here's a picture of the cheque hand over. 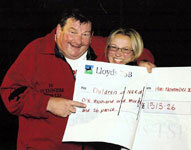 PDSA Event where John balanced a 22 pole, another world record and also here's a picture of the cheque handover. 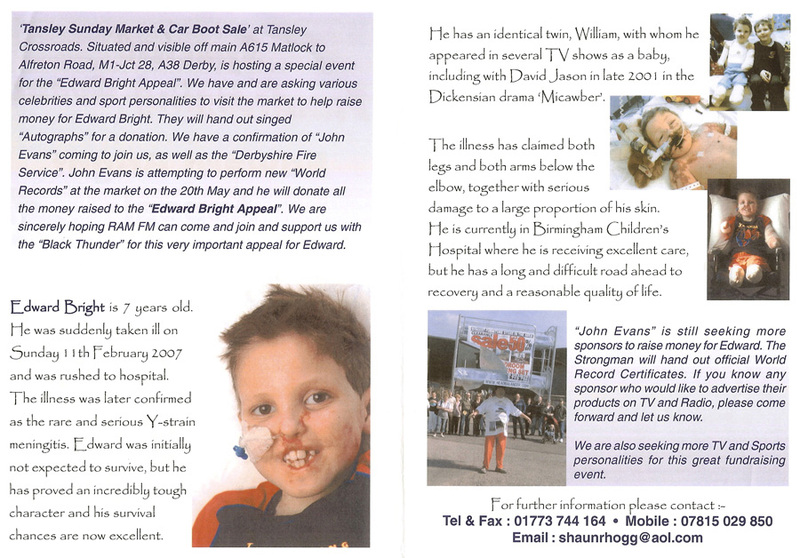 John Evans was invited to perform at Peter Dowdeswell charity event on the 12th & 13th of June 2010. The event was titled Record Holders Republic Olympics where record holders and public was invited to try to set new records. John Evans set the new world record for balancing 25 Gorilla tubs on his head for 15 seconds. This was the largest item John as ever balanced measuring 10 long and 6'3" high. 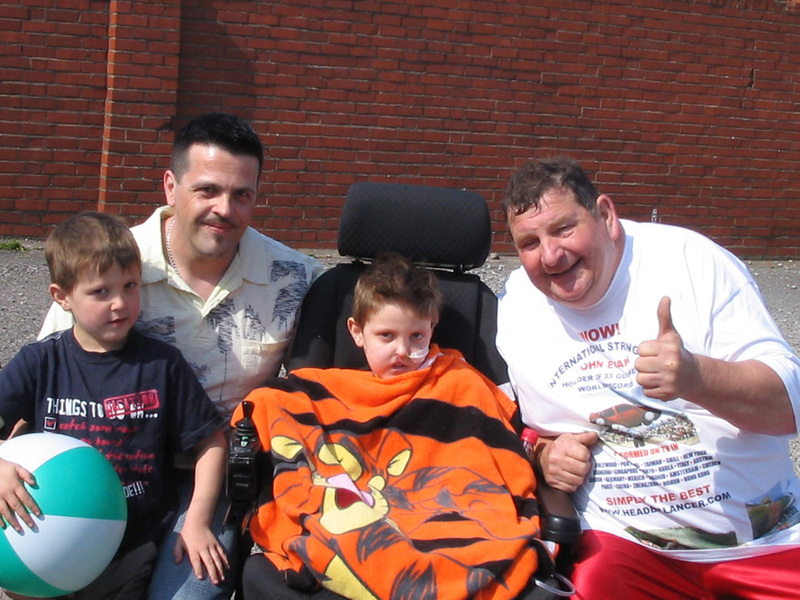 The event raised money for Peter to buy an electric wheelchair for disabled person in Northampton. 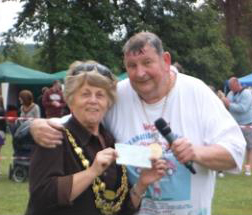 Head balancer raises cash for Bewdley Mayor's charities. A BRITAIN’S Got Talent contestant helped raise cash for the Bewdley Mayor’s charities when he performed a balancing act at the town’s carnival. 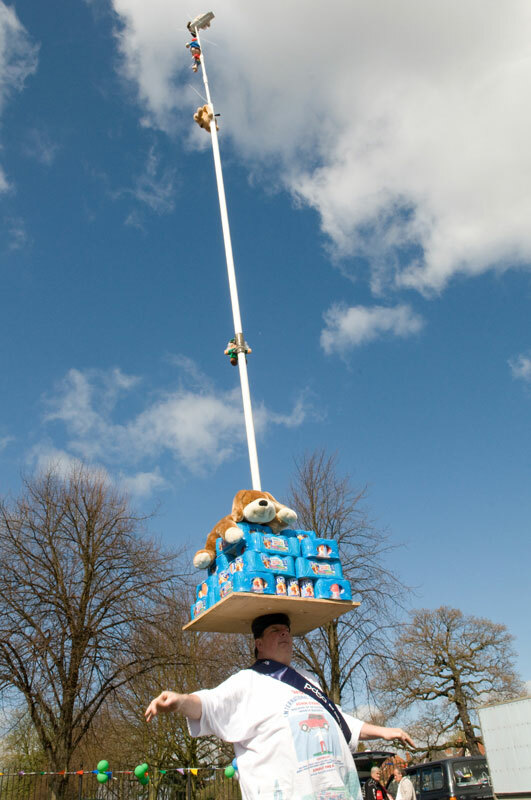 John Evans balanced a washing machine and a settee on his head and walked around the carnival field to raise cash for Dr Jan Adams’s charities, Dementia UK and the Midlands Air Ambulance. John Evans turned 65 years old, March 31st 2012, the age most people retire!!! 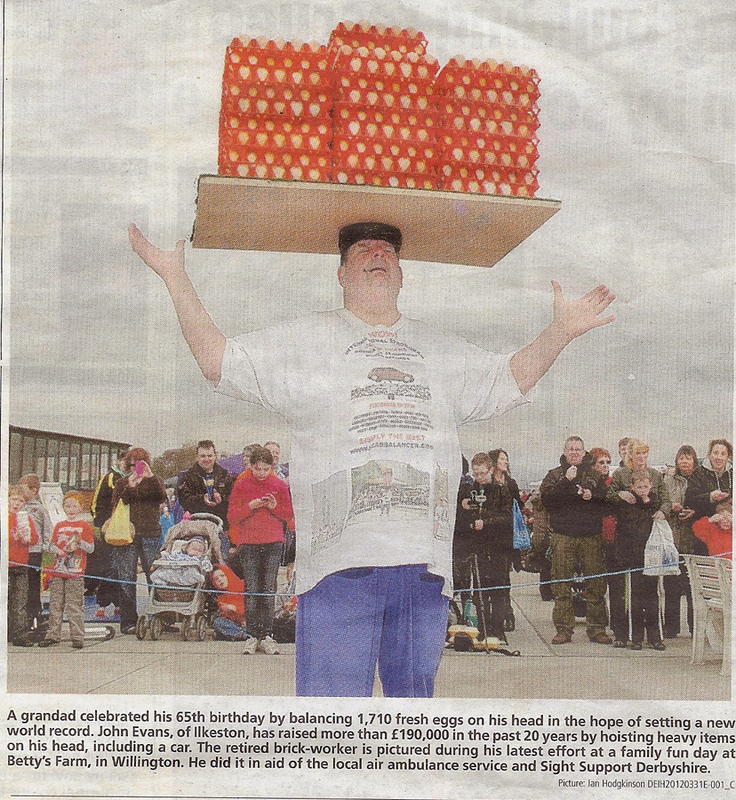 But not John, he performed at a charity show and set a New World Record for headbalancing 1710 eggs a total weight of 118kg, in the process raising £500.00 for Sight Support Derbyshire and Air Ambulance East Midlands. 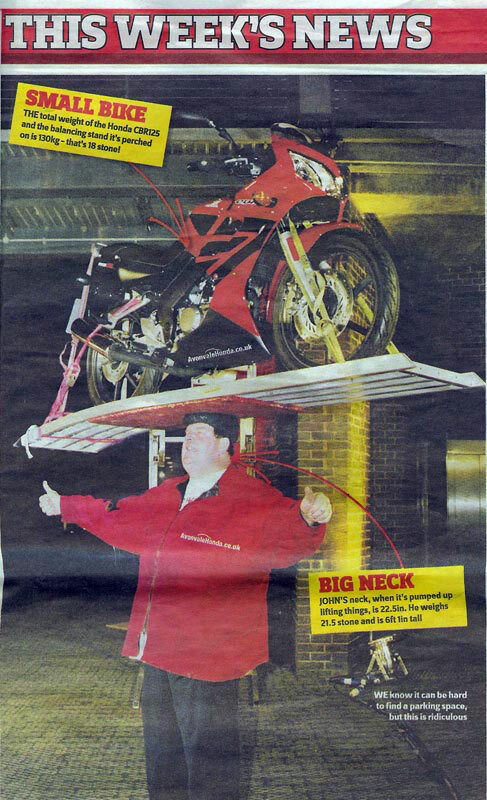 In the last 20 years John has been doing stunts, headbalancing items and has raised over £200,000 pounds for charity doing things just like this. John has 33 Guinness World Records and 44 Record Holders Republic World records. RHR World Records are another organisation who records only human achievements world records and in their book every record gets featured unlike the Guinness Book who only has just a few pages of human achievements. 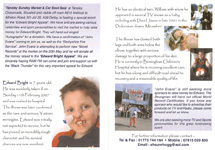 John Evans from Ilkeston, balanced a 70 kg washing machine for 23 minutes 07 seconds on the 13th May 2012 to raise money for DEBRA, a charity that supports people with the painful genetic skin blistering condition Epidermolsis Bullosa. 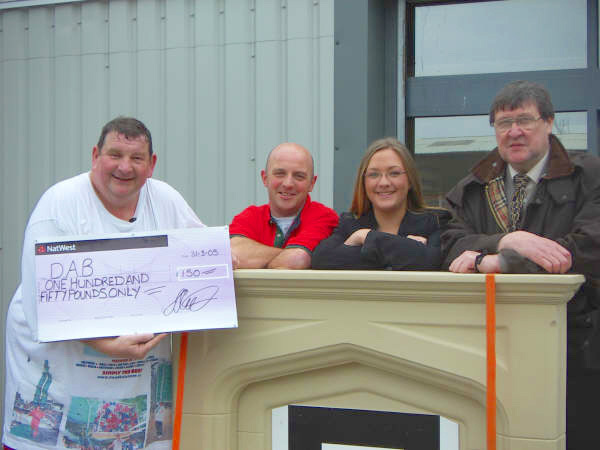 The washing machine was supplied by appliances on line and was raffled off at the Ilkeston Debra Charity shop. Aged 65 and with a nasty cold, you'd think John Evans might have muffled himself up and passed the afternoon in front of a roaring fire. 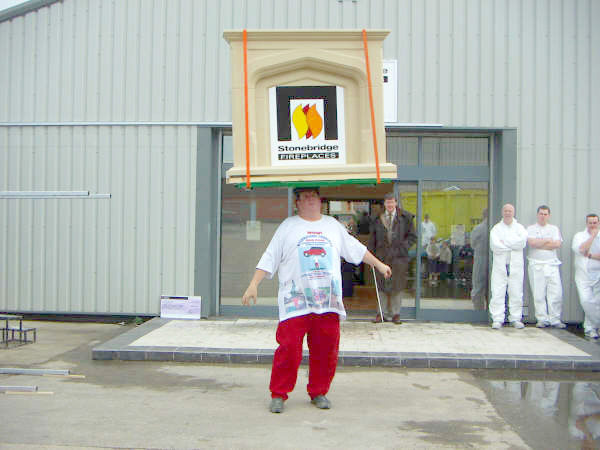 Instead, the retired builder spent nearly an hour lifting huge and awkward items on his head, raising more than £1,000 for charity. A woolly scarf was his only concession to the chill weather and his sore throat. The effort brought pleasure to hundreds of people who attended the event at Brown's the Builders Trade Centre on London Road, Derby on October 26, 2012. 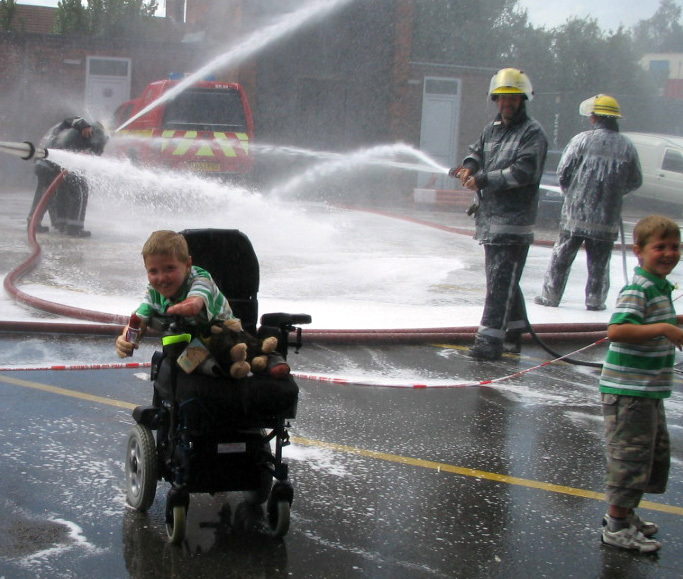 The money went to the Derby-based charity Umbrella, which helps sick children and their parents through bad times. The retired bricklayer said: "I was really delighted to have done it. You don't want to let people down. "I've always been fit and never had a day off in my life but this was the worst cold I'd ever had. 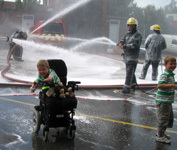 "Even geting off the sofa was a struggle and it was really bad when I bent forward. But you just have to get on with it," added John after the effort. 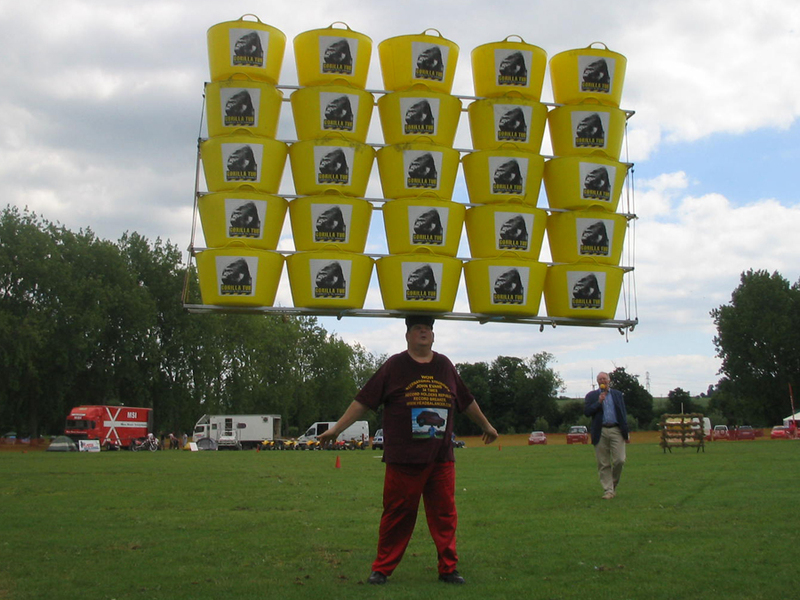 He began by balancing four very large water butts on his head and then did the same with ten dustbins which are made to contain a small fire and have chimneys in their lids. After that he balanced six wheelbarrows and a cement mixer - before ending the show with his latest prop, which could become almost as famous as the car he has raised in shows around the world. John, a skilled handyman, created a Tardis from the legendary BBC TV Dr Who series. The large blue box - which resembles a police telephone booth - has been fitted with flashing lights and theatrical smoke. It brought pleasure to Dr Who fans of all ages. 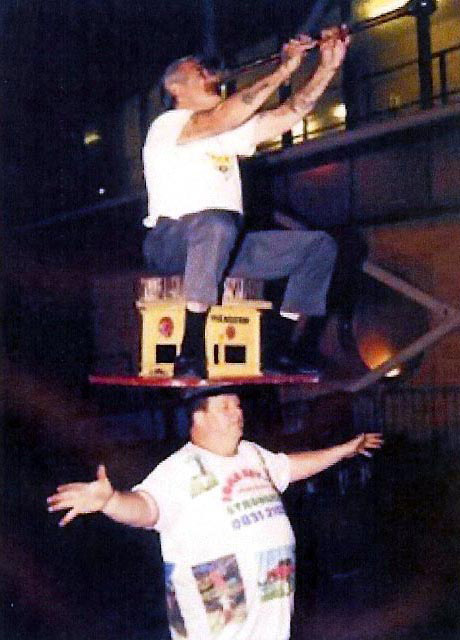 Now John is to send details of his fire dustbin lift to Guinness and the Record Holders' Republic to get the achievement recognised as another world first. 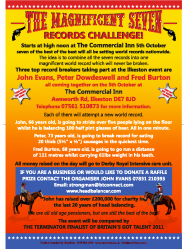 John Evans was one of seven record breakers who took part in the Magnificent Seven Records Challenge in October 2013. 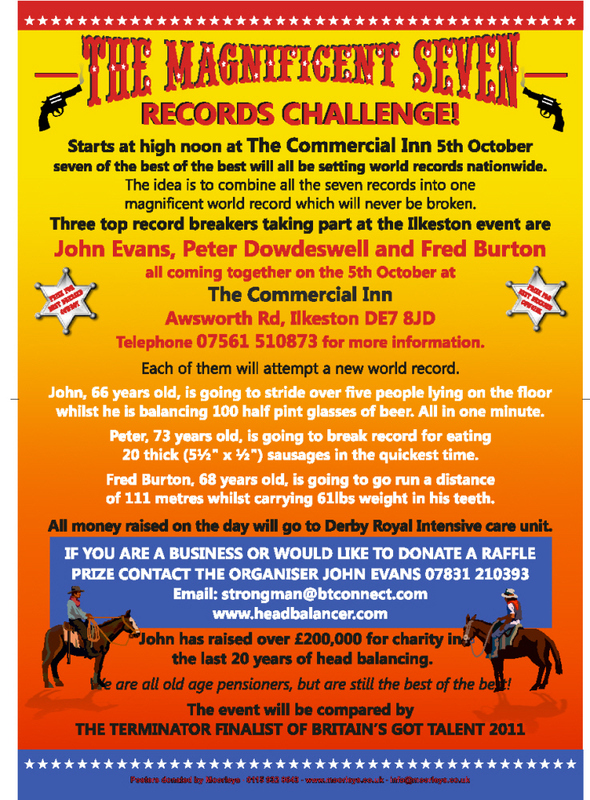 John came together with Peter Dowdeswell and Fred Burton on 4th October 2013 at the Commercial Inn in Ilkeston. 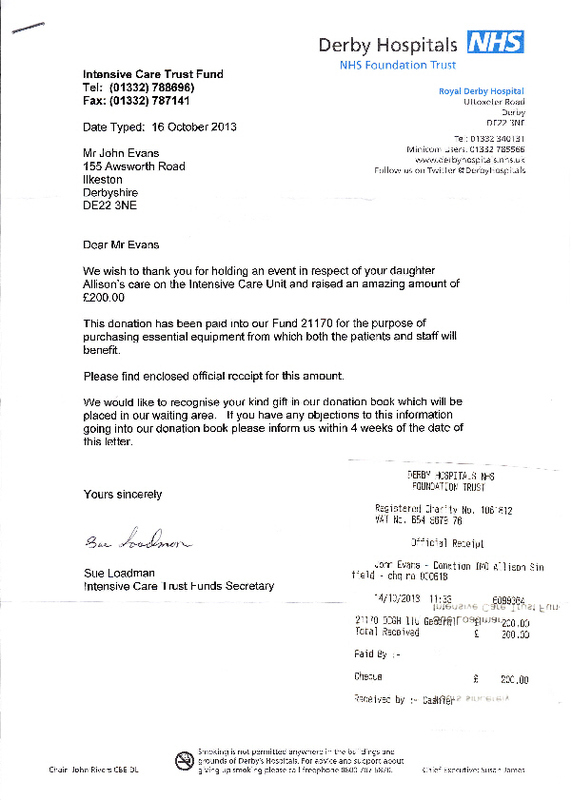 £200.00 was raised at the event for the intensive care unit at the Royal Derby Hospital. 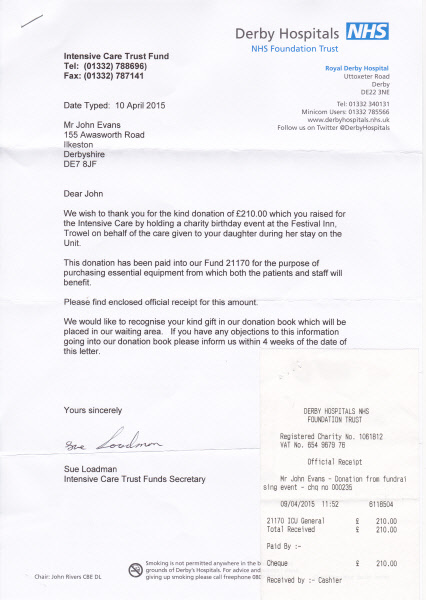 John Evans from Ilkeston held a charity event for his 68th birthday at The Festival Inn, Trowell on 28th March, 2015. 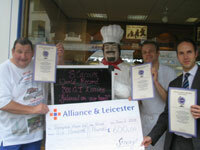 Profits from the event were donated to the Derby Royal Intensive Care Unit. Hosted by Stuart Arnold, the event feaured guest appearances from the great Peter Dowdeswell, Simon Plant and Johnney Golden, plus various head balancing feats from John himself. 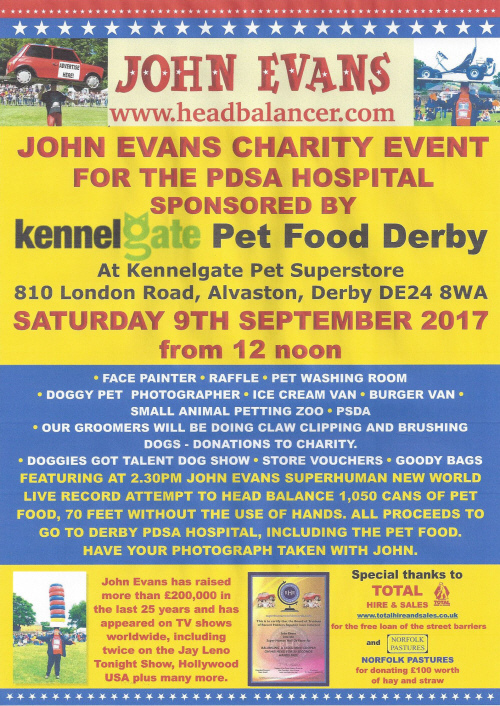 John Evans balanced 140 cans of pet food 65 Kg and walked a distance of 88 feet hands free at Kennelgate Pet Foods Superstore at Derby on 9th September 2017. 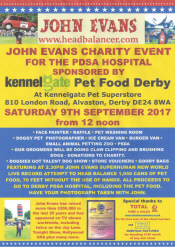 The event raised over £800 for PDSA Pet Hospital in Derbyshire.